Make the most of your unused vertical space by installing a Raised Storage Area, potentially doubling or tripling your floor space. Colby Dandenong offers cost-effective raised flooring systems that do not require permits, are modular and relocatable – should you ever decide to move. Raised Storage Areas can be built from structural beams and columns, or better yet, built with a racking system to integrate shelving or even carton-live storage to provide both a storage area above and a picking area below (or a combination of both). 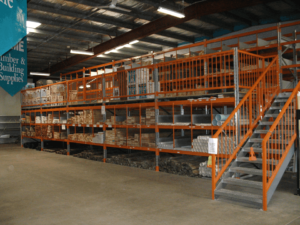 There are many Raised Storage systems to choice from, so ask Colby Dandenong to advise on the best, cost-effective solution for your business requirements. In the current competitive environment, warehouse space is under pressure. With the need for greater delivery for enabling flexibility and an expanding range of SKU’s (goods in-store), there is a growing demand for warehouse space. Space comes as a premium, and relocating to larger premises is expensive and disruptive. Clearly, existing floor space is a valuable resource in factories, warehouses and distribution centres. Every square metre should be utilised, especially vertical space. Our Mezzanine Raised Storage Areas are a cost-effective solution designed to increase the capacity of your existing facility, often negating the need to move and the associated relocation costs. A raised flooring solution has the potential to double or triple your floor area by making use of unused overhead space. Where greater security is needed for your stock, there is the opportunity to create secured storage for high-value goods. Why you choose Colby Dandenong for Raised Floor Systems ? The Colby Raised Flooring Systems offers almost unlimited options. In both medium-duty and heavy-duty installations, large spans of column-free space are possible with special profile beams. In heavy-duty applications, we use Colby patented Sigma beams; for medium-duty, the ColbyRACK special profile beam is used. Both systems are designed to deliver larger spans of open area and reduce installation time and costs significantly. Designed by the industry-leading structural engineers at Dematic (owners of the Colby brand), our raised flooring system is made from local high-tensile structural steel. All our products meet and often exceed all the relevant Australian standards. Bulk storage, order picking areas, or office rooms can be added without interrupting the ground area workflow. And the floor space can be easily modified to accommodate the changing needs of your business. Conveyors, lifting and loading devices, pallet gates, stairs and handrails can be easily integrated. Existing shelving and racking, carton-live storage and heavy-duty shelving systems can be seamlessly integrated. Fire protection equipment such as sprinklers and smoke curtains can be installed. Electrical wiring can be mounted under the access floors, protected by our patented Sigma beam profile. Lighting can be installed with ease. Colby utilises advanced computer aided design technology that allows the customer to see the storage ideas in place. A custom designed solution of millimetre precision can also be built. Modifications can be made to the 3D model before final manufacture and installation take place. Our team of storage professionals has the experience to design and develop a new Raised Storage Area for you. Colby’s raised floor storage system is a simple, safe, practical solution that’s highly cost-effective. Contact us at 1300 265 291 to discuss your requirements and benefits a raised storage area will bring you. ©2018 Colby Dandenong | All rights reserved.